Choose a threshold ramp for facilitating the use of a wheelchair or scooter in your home. These small ramps are easy to install and a cost-effective solution for bypassing height obstructions while riding your power wheelchair or mobility scooter. 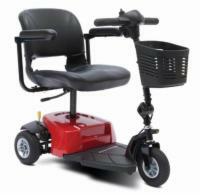 Constructed of extruded aluminum that will not rust or corrode with a non-skid surfaces. Designed to allow scooter and wheelchair users easy transportation through doorways, sliding glass doors, and other raised landings. Sturdy aluminum construction with an impressive 600-lb. weight capacity. These non-skid surfaced threshold ramps are highly resistant to rust and corrosion. Eye-pleasing bevel and 100% recycled material for peace-of-mind. Bariatric capacity. Made of 100% recycled material and designed for both indoor and outdoor use. Bariatric capacity. 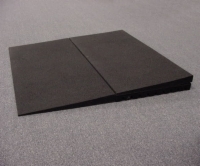 Combine these risers with Rubber Threshold Ramps to bridge thresholds up to 4" high. Our best price on threshold ramps - buy two and save more! Need multiple threshold ramps? Buy two and save even more!